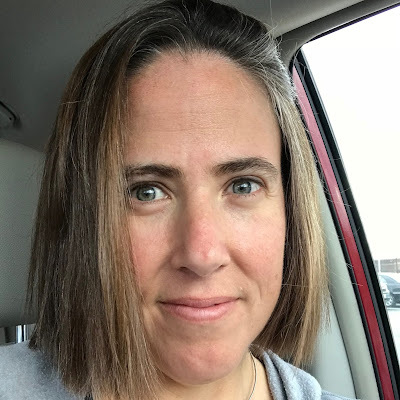 I know that it is December and we got back from summer vacation months and months ago, but I have to finally write this because Sam keeps asking for it. ARE YOU HAPPY NOW, SAM?! ARE YOU HAPPY NOW?! Remember how months ago we went to a cottage and then a cabin in Wisconsin? Well, after that we went to a resort town called Wisconsin Dells. We'd been there three years ago and Team Stimey was ready to go back. We arrived way after bedtime, so we checked in to our hotel and got ready for bed. I remembered something we had left in the car and went back out to be greeted by the dawning realization that very clearly there was a cheerleader camp taking place at the resort and ours was the only room on our entire floor that wasn't full of teenage girls. I should take a moment here to pay homage to the hero of our vacation: my noise canceling headphones. Seriously. This would have been a very different vacation without them, especially in Cheerleaderville. 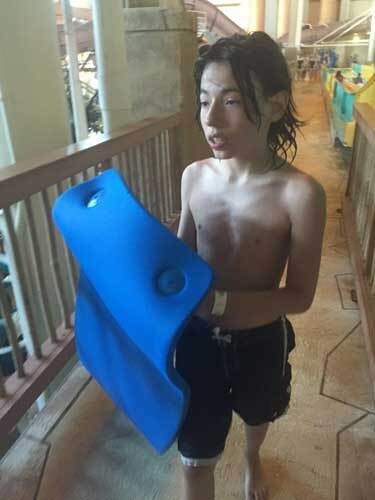 Jack in particular had been really excited to go back to the waterpark. 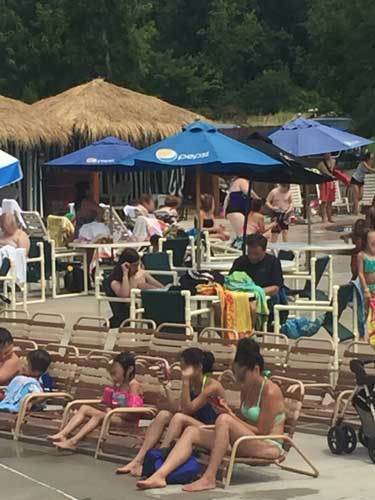 He, along with Quinn, couldn't wait to get in the wave pool and the lazy river and the waterslides. This is one of his relaxo places. And this is his excito place—Jack on the left, Quinn on the right. Sam and Alex, however, were a little less excited by the whole deal. If you look closely, you can see Killjoy One and Killjoy Two reading books at a table. Alex did eventually join the water people and Sam spent some time swimming, but I think he might have only gone on one waterslide total over the course of three days. That's okay though, because there are so many other things to do at Wisconsin Dells. I spearheaded one particularly successful outing to take advantage of these attractions early on in our stay. I had seen a poster for something called Zombie Outbreak and it looked awesome. It's like laser tag where you wind your way through a dark, twisty building and people dressed as zombies jump out at you and you have to shoot them in the head or else they tag you and you lose points. Clearly this was the right place to take my kids. I asked everyone in the family if they wanted to join me and even showed them a short video I found online so they could know what to expect. Turns out, the video didn't fully capture the experience of Zombie Outbreak. 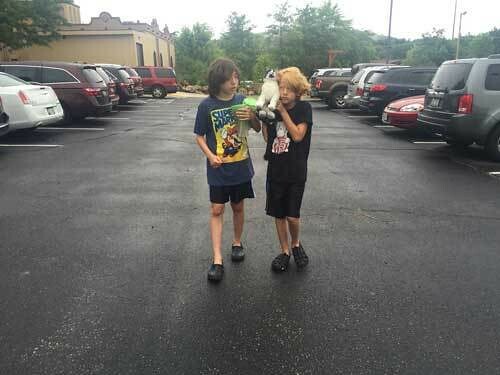 Quinn and Alex were smart enough to hear “zombie” and stay in the car. Sam and Jack were foolishly brave. You guys, it was so much fun. Although when we were getting our training and Jack was all, "I don't like jump scares," I probably should have guessed that it wasn't going to go well. At least I learned who I'd be able to count on in the zombie apocalypse. Answer: ME. It went SO badly. Jack was devastated by the experience and ran out of the building crying once he was finally able to escape. Sam covered his dismay a little better. In a desperate bid to make Jack love me again after I permanently scarred him, I suggested that we do some go-karting. Mission success! Jack loved me again. 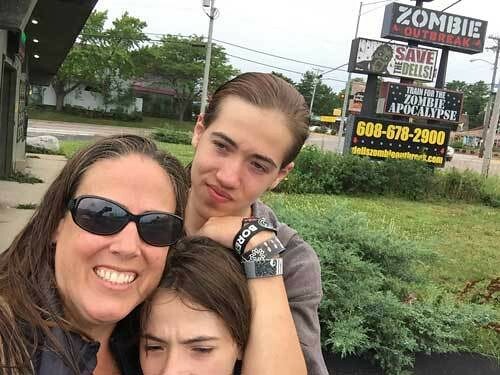 Quinn, on the other hand, was collateral damage in a high speed go-kart wreck caused by reckless teenagers and bashed his head against the headrest, sending him to the car in tears, making that two of my kids I'd badly damaged in the span of an hour. Jack took Quinn’s extra ticket after he was injured. As long as only one kid at a time is emotionally, psychologically, or physically hurt, I’m doing okay, right? Knowing when we were beat, we headed back to the hotel for dinner and more swimming, which, thanks to poolside dining, took place at the same time. Dinner was made even better by the arrival of vermin looking for a handout. 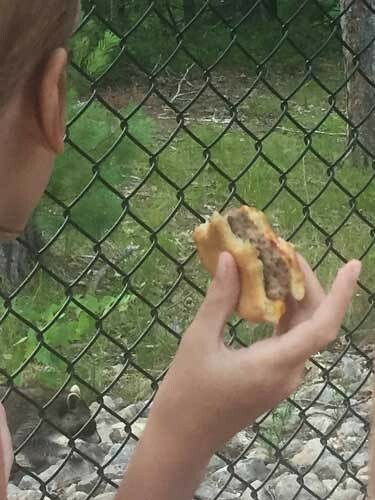 I’m guessing that raccoon is pretty well fed. 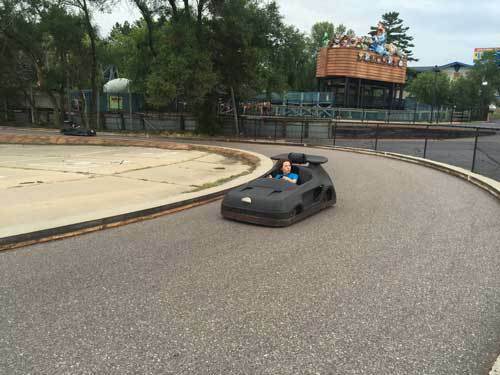 The last time we'd been to Wisconsin Dells, the standout event was JET BOAT! Naturally, we wanted to do it again. 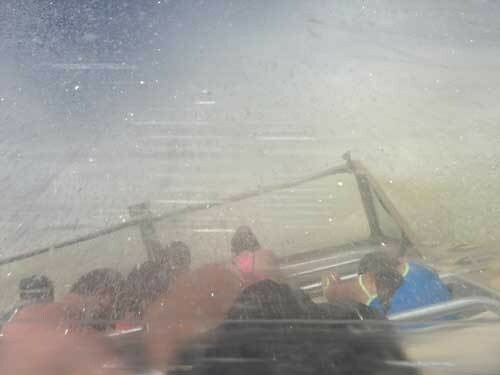 JET BOAT! 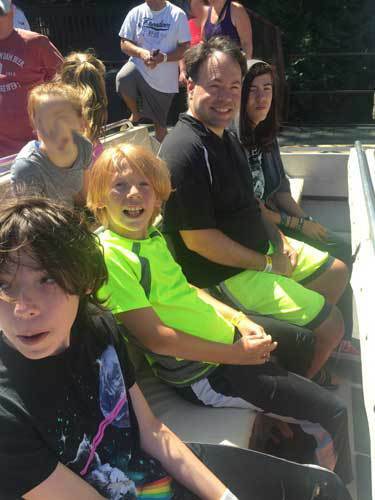 is a tour of the area waterways on a speedboat that spins out and splashes the passengers and is generally awesome for the whole family. Not like a zombie apocalypse at all. Look at everyone all dry and excited. And we were left with this. 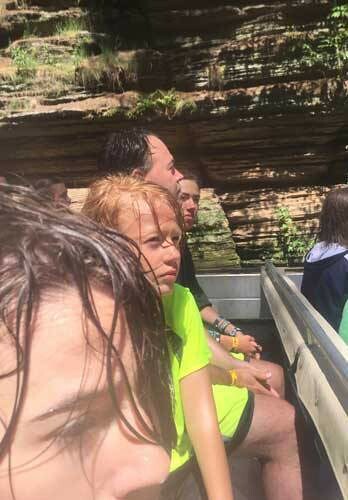 If you look really closely, you can actually see water dripping from Jack’s nose. Alex really wanted to go miniature golfing at this very cool course that we drove past and we were going to do it after JET BOAT! 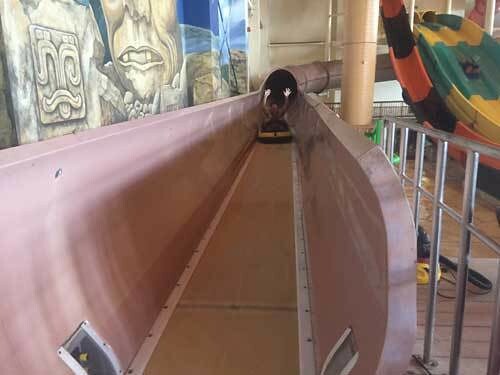 but for obvious reasons, we were unable to follow through on this and therefore Alex wasn't able to do the ONE GODDAMN THING he wanted to do in all of Wisconsin Dells and we are MONSTERS. 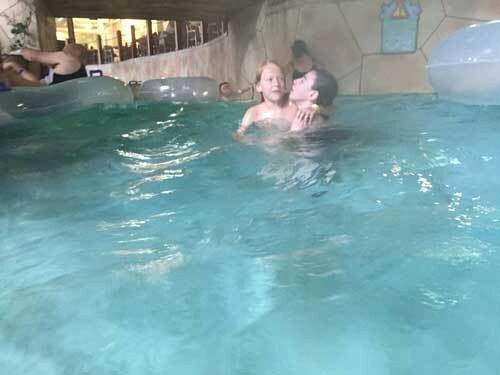 As we did each night at the Dells, we spent the evening at the indoor water park. 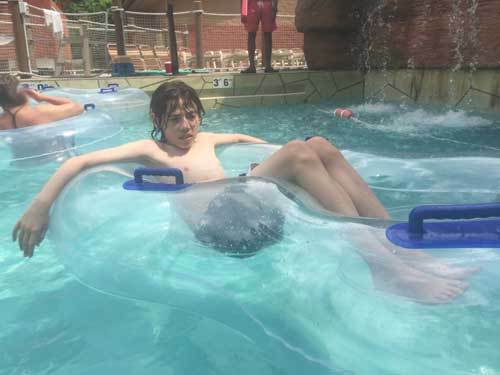 Jack and Quinn spent hours in the lazy river and lured me in as well. I liked to float happily around and occasionally take photos of my kids with my phone safely encased in its waterproof pouch. Jack liked to direct my happy floating to spots underneath waterfalls. This is probably the least flattering trio of photos of me ever, but it is unlikely you will even notice that what with Jack OMG JACK AND HIS FACE behind me. We only had one day left, of which we took full advantage. 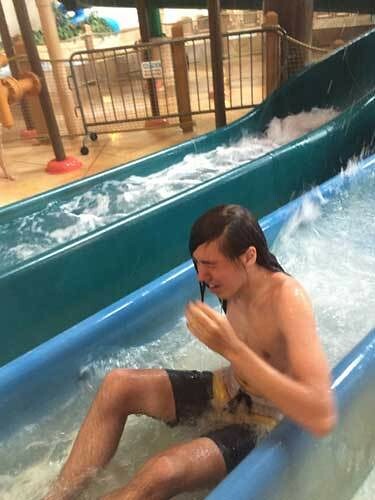 Jack and I went on a bunch of waterslides together. 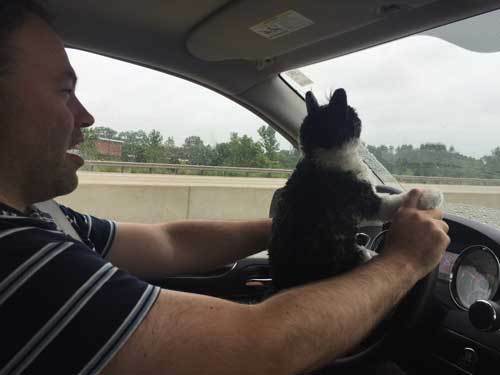 He’s a fun companion. 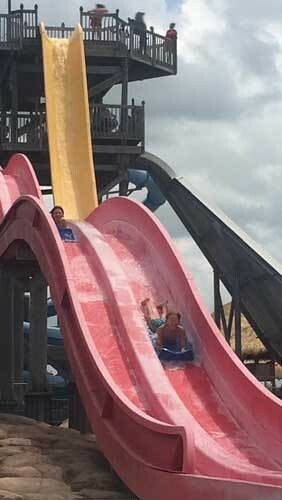 This is Alex with Jack on the roller coaster waterslide. I never even knew such a thing existed. It was great fun. This is the one slide Sam went on. I think he lost a bet and had to do it. I wasn’t going to miss the chance to photograph him. And I’ve probably said it 800 times, but Quinn and Jack together? They are the best. Here they are hugging and carrying each other in the lazy river. Just because. "But wait, Stimey," you may be thinking, "Did you go on any waterslides? Did anyone take a photo of you?" Don't worry. I left my phone with Alex when I went on a slide and he captured me at the bottom. I know it’s brave to put a swimsuit photo of me online. Our very last night in Wisconsin Dells, we went to dinner at the hotel steakhouse. We'd gone to the same restaurant last time we'd been there. Their motto is "Where Size Matters." The first time we'd gone, Alex and I had ordered a side dish of potatoes made up of probably five pounds of potatoes that made us feel bad for being Americans. This blade outside the steakhouse wasn’t sharp enough. 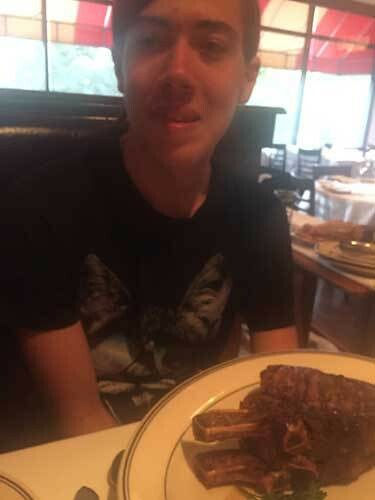 But—and this is probably why Sam wants me to write this post so goldang bad—Sam remembered from the last time we were there that there is a 50-ounce steak on the menu and he had been talking for three years about how he was going to eat one. 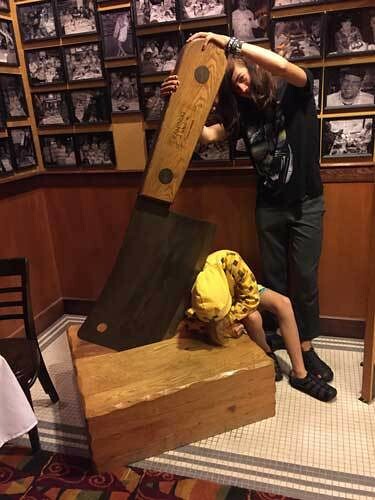 But Alex and I are reasonable people—WE ARE—and no way were we going to buy him a 50-ounce steak. That said, we were happy to order the 50-ounce and two plating fees so all three kids could share it. That is a lot of steak. 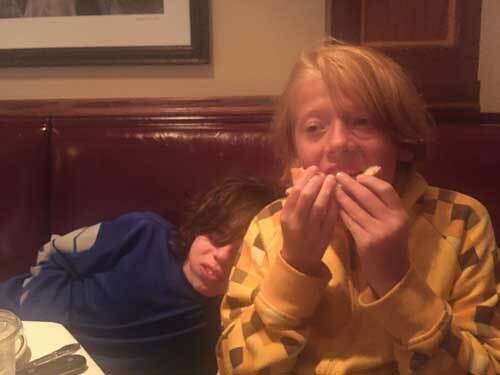 Unfortunately, both Quinn and Jack had filled up on bread and they each ate about a bite of it then returned their uneaten portions to Sam's plate. Based on this photo, I think Jack may just have been too tired to eat as well. Alex and I consumed our reasonably sized dinners and watched Sam consume huge amounts of food in a short amount of time. One of the staff even came out from the kitchen under the pretense of removing something from our table to gawk. He even gnawed off the hard-to-get meat stuck to the bones. It took him maybe ten minutes. It was, quite honestly, a feat. 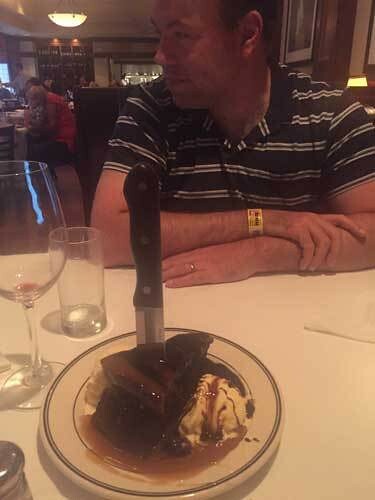 And then he shared a dessert with his brothers. He was a little hysterical for the rest of the night. I think he went into Meat Shock. I kept a close eye on him to make sure he wasn't going to barf or die or something. He seemed to emerged unscathed. 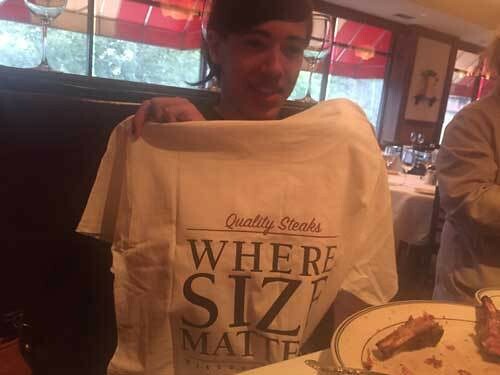 Plus, the restaurant gave him a t-shirt! 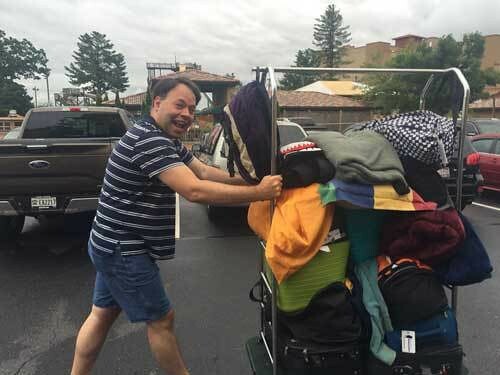 It turns out that Team Stimey needs a lot of stuff to survive. ...and the kids did their part. Thanks for carrying those two EMPTY cups and a stuffed cat, guys. From there it was just a billion and six hours to drive home. This is how you amuse yourself on a billion and six hour drive. This turned out to be one of the most fun and relaxing vacations that Team Stimey has been on for a long time. It was nothing like the long, stressful stretch of time that it took me to write about it on the interwebs. Now it might be time to go on another vacation! Thank you for being so thoughtful and waiting to write about summer until it was appropriate for my timezone. Also, I didn't read the second half of the post because JET BOAT! quickly followed by OMG JACK AND HIS FACE! Those three photos are the most delightful and not hateful things I have ever seen on the internet. I totally waited just for you, Bec. Awesome summary. The "swimsuit photo" made me laugh out loud! Congratulations to Sam on his amazing accomplishment. Does he wear the t-shirt constantly? Or is it in a place of honor in your house? The Dells are a pretty cool place to vacation. My kids have talked about going back, too.